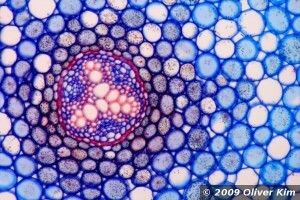 Vascular tissue of a Buttercup (Ranunculus repens) root. The root was microtomed and stained. 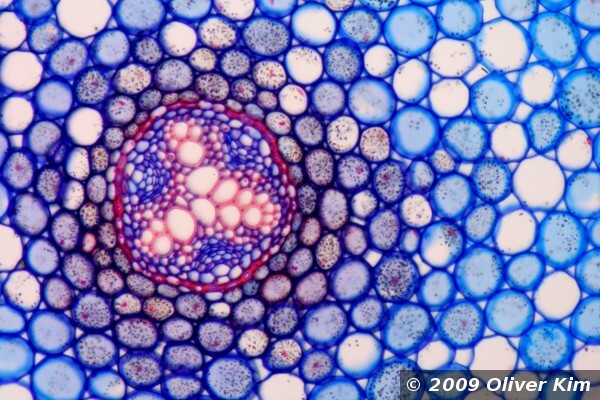 The triangular structure on the left is the vascular tissue, used for transporting substances up and down the plant. Ranunculus is a large genus encompassing about 400 different species. They possess bright yellow or white flowers and some have orange or red flowers. All members of the genus are poisonous. The toxin is inactivated when dried, hay used for livestock is therefore safe.